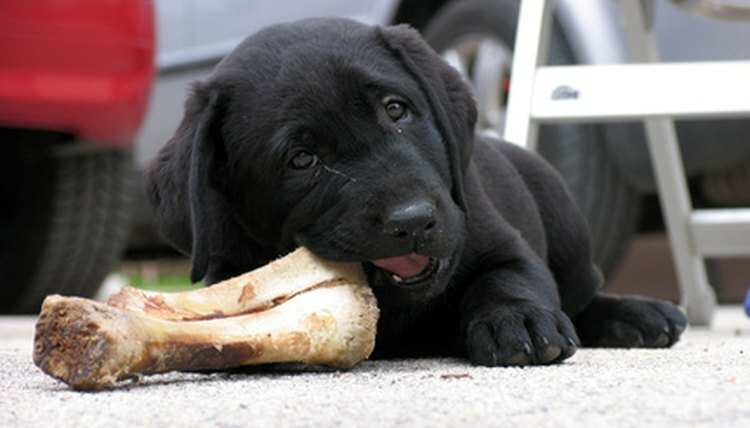 Any dog can benefit from chewing on bones. Chewing on bones cleans and toughens teeth and gums, provides mental stimulation for the dog and reduces the chance the animal will chew on other household items. Dog bones are readily available at any pet supply store, but they can often be procured from farmers and butchers. Fresh bones must first be sterilized to kill any bacteria from the meat. Strip the bone of as much meat as possible. Much of the meat can be pulled off by hand, but tough tendons may need to be cut off with a knife. Do not worry if all of the meat cannot be removed. Place the bone in a pot of water. The water level must be at least 2 inches higher than the bone. Put a lid on the pot. Put the pot on the stove at high heat. Let the water boil for 30 minutes to kill bacteria, and to boil off any small pieces of meat. Remove the pot from the heat after the 30-minute boiling period. Dump the water and let the bone cool down to room temperature. Check the bone for any additional meat. Pull the meat off the bone. The bone can be given to the dog once it is clean and cool. Do not give dogs small bones, such as those found in chickens or turkeys. Does Laying Mash Help Hens Produce More Eggs?